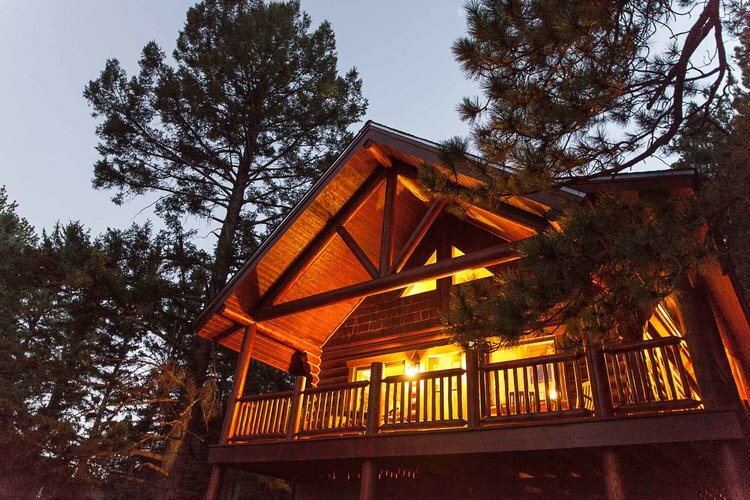 Nestled at the foot of the Wheeler Peak range, Eagle Mountain Lodge is a spectacular one of a kind property located between Angel Fire and Eagle Nest, NM. Resting on 42 beautiful acres, this compound features a 3200 sq ft main house along with two cabins, a duplex cabin, and studio apartment all with stunning views of the Sangre de Cristo mountain range and Eagle Nest Lake. The grounds feature forest, meadow, and a trout stocked pond with nearby gazebo. Along with hiking trails, abundant wildlife includes elk, deer, wild turkey, and bald eagles! Eagle Mountain Lodge is currently being utilized as a non-profit spiritual retreat center and can sleep up to 30 people. This turn-key facility could be a treasured luxury family compound, but also be operated as a Bed and Breakfast, VRBO, hunting/fishing lodge (comes with an annual elk tag), or ski lodge with three local ski resorts only minutes away (Angel Fire, Taos, Red River). On top of that there are endless adventures awaiting in the 1.5 million acre Carson National Forest. So many possibilities! The Main Lodge is the centerpiece of the retreat, built in 1998 and updated in 2016 with granite counters, dog wash, and cabinetry. Truly a luxurious mountain lodge that can be lived in full time, part time, or leased! - The Master Suite has a sitting room/office, steam shower, Jacuzzi tub, propane fireplace. - Sleeps up to eight! The Nest and Forest Cabins have a real woodsy feel, nestled among the great Ponderosa pines and overlooking the Moreno Valley. A huge eagle's nest is located just beyond the front porch! These are sister cabins (duplex style) that can be arranged to adjoin, or be occupied separately as individual units. The beds on each side can be arranged as a king or separated into two twins as preferred. Includes sofa sleeper on each side. - Sleeps up to four on each side or eight total! The Elk Cabin is our newest and most modern luxury cabin, built in 2016! Details and styling of this rustic, solid log cabin are second to none! Hidden among the Ponderosa pines, the spacious front porch features incredible views of the mountain range and Eagle Nest Lake. You'll fall in love with this cabin! - Sleeps up to six! The loft studio is a charming living space above the detached garage. With a full bath and kitchen, the Loft is versatile and can be used as either a studio apartment with beds and living area, or as a great meeting room for conferencing, workshops, or other gatherings. Depending on configuration, this space could sleep up to four! - Living area, also suitable for conferencing, workshops, or other gatherings.